Home Food Archive by category "Recipes"
I haven’t been writing much lately because I’ve been busy over on my Tarot Site having a good time and I’ve been wanting to share my progress in dealing with my social and general anxiety (which is AMAZING, by the way) but I’m going to give you just a little snippet today because I need to tell you about these cookies. These are Inside Out Carrot Cake Cookies and I’ve been making them for years. And I love them. I needed something to bring to a Community Kirtan that my friend David told me about. Two years ago, I never would have considered going to a new place with new people where I knew only one person. Never would have happened… and although I call David my friend, we really don’t know each other that well, but he’s one of a growing number of people that I hug as a greeting so… yeah. Friends. And I went and I didn’t explode or freak out when I got lost or hide in a corner the whole time. I actually ended up doing tarot readings for 5 people! I had a lot of fun. I probably won’t go again because although it was lovely, it’s not really my thing. I decided on these cookies because I’m always looking for a reason to make this deliciousness. There are some important things left out of this recipe, in my opinion. Which is why I’m posting it here with my revisions. 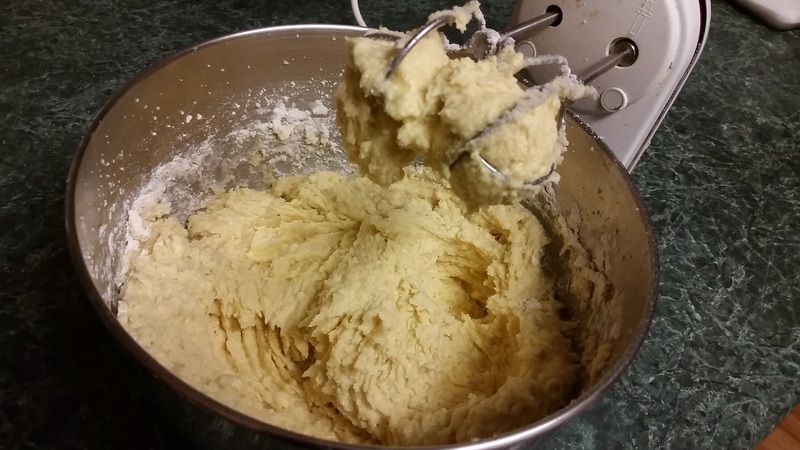 You will make a better cookie if your eggs and butter are at room temperature. Before we became refrigeration nuts, humans used to keep eggs and butter on the counter. And to tell the truth, I still keep my butter out. I refrigerate my eggs because commercial eggs are washed. If they come right from the chicken, they have a protective barrier to prevent spoilage. But yeah, take them out of the fridge a few hours ahead and thank me later. The other thing is the original recipe tells you to beat your butter, sugar and eggs all together at once. Cream the butter and sugar together. This is where that room temp thing comes in handy. King Arthur Flour has a great post on this so I’m not going to reinvent the wheel here. Another thing is the original recipe says it makes 13 cookies. It makes 6 cookies filled with cream cheese and one lonesome half cookie that has no idea what to do with itself except to be a delivery device for any leftover filling … of which there will be none. So, I double it. So, here it is. The Inside Out Carrot Cake Cookie Recipe for your next pot luck or emotional eating party. Drop cookies by 1½ tablespoons about two inches apart and bake, turning halfway through for 16-18 minutes. They will spread. Allow to cool on the sheet for one minute and then transfer to a cooling rack. While cookies are baking, combine cream cheese and honey until smooth. When cookies are completely cool, sandwich two cookies together with a big glob of filling. Look.. I know it’s been ages since I posted something. and this draft has been hanging out forever … so I’m just going to post it. Because you all should make this. I cobbled together a few Moroccan Beef recipes from the interwebs and came up with this. 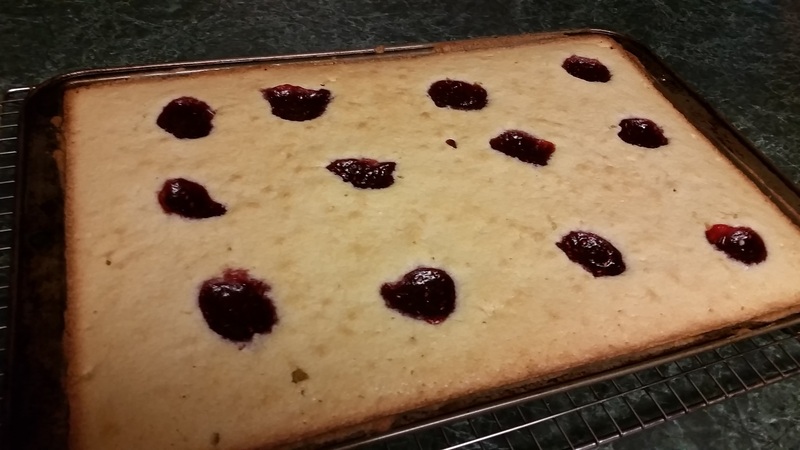 So, please forgive my incredibly lame post and just make the recipe… okay? I have always had a soft spot for cinnamon and beef together, ever since I had my first taste of kibbeh. The seasoning on this meat reminds me of that delicious Moroccan treat. Now is a good time for a sprinkle of salt and pepper. Shove all of the stuff in the skillet to the edges and crumble the ground beef into the middle. Shove everything to the edges again, and dump the pine nuts in middle and toast, stirring constantly until slightly toasted. Mix the pine nuts in with everything else and turn off the heat. If you are one of those people who feel that raisins ruin everything, go ahead and substitute ¼ cup of chopped dried apricots. reck·on·ing ˈrek(ə)niNG/ : archaic -a bill or account, or its settlement. Way, way back in 2014, Marisa from Food in Jars included my picture of the Puddles that my mom made for me in her link round up. I have a special place in my heart for these cookies. They are from my childhood… and I love them. But I rarely make them. Anyway, I promised to share the recipe as soon as I found it. But.. I didn’t. I held onto it for a while. And then I baked them.. and they came out.. wrong. When we moved, I found my jelly roll pans in the attic. I think they were there for all 12 years we lived in that house. Take a gander at the difference in size and I think you’ll see why I had a problem. 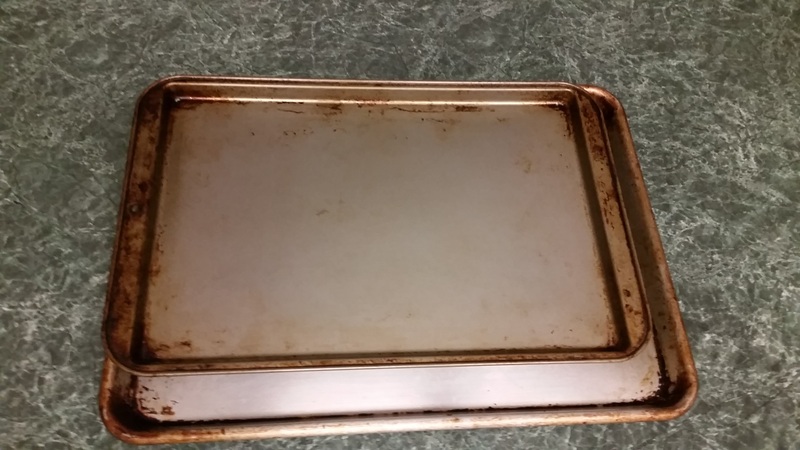 See how much smaller the cookie sheet is than the half sheet pan! So,we moved.. and I forgot about the puddles again.. but then.. THIS WEEK Melanie asked me for the recipe. And I was totally surprised than anyone was still waiting for it. But, don’t make them with Oleo. Does anyone even know what Oleo is anymore? Make them with butter and thank me later. Bring your butter and eggs to room temperature. They cream better that way. Cream the butter, eggs and sugar until fluffy…REALLY. There is no leavening in the recipe. The batter will be thick. I mean… THICK. Kind of like frosting. I turned the pan halfway through baking and they were done in 25 minutes in my oven. The middle will spring back like a cake when touched. They have sort of a crispy crust on top when they come out. After the powdered sugar sets in and they sit for a day, they are like a dense cake and the top softens. You can, for fun.. or VALENTINES if you’re into that kind of thing, use cookie cutters to cut out heart shapes (or other shapes). Plop your jam in strategic places in order to do that. Bonus: you get to eat the scraps. Add the vanilla and flour and mix until combined. Batter will be thick. Spread batter evenly in the cookie sheet. Bake for 25-30 minutes until the center springs back when touched. Edges will be crispy. Dust with powdered sugar while still warm. Cool and cut into 20 squares. Store between sheets of waxed or parchment paper in an airtight container. I have long been a fan of Mel Joulwan‘s recipes. So much so that I bought Well Fed and Well Fed 2, even though I don’t eat Paleo. Mel uses a lot of “tougher” cuts of meat which I really appreciate as I enjoy a good long braise. But here is my problem. I’m impatient. Like super impatient. Also, I bought an Instant Pot about 6 months ago and when people said it was life changing they WERE NOT KIDDING. So, now I want to use it for everything. I adore Mel’s recipe for Thyme Braised Short Ribs which calls for cooking them on the stove top for four hours. But I didn’t start cooking dinner until 6PM because I was super busy brewing beer. After removing the short ribs from the pot, I added the veggies. Short ribs in half the time. How beautiful do these short ribs look?